» Diabetes in the driving seat? For some, the answers lie in the political sphere: Sir Michael Marmot famously pointed a finger at UK austerity, while in the US influential research considered financial insecurity and the opioid crisis. Other commentators felt austerity was insufficient to explain the patterns observed, which they saw as more akin to an infectious disease. Within Life and Pensions circles however, one health condition had long been emblematic of the unsustainability of mortality improvement rates: type 2 diabetes mellitus (T2DM). "[It] is hard to conclude anything but a medium-term horizon, with mortality improvements struggling to rise above zero. This ‘U-turn’ situation for pensioners is mirrored at younger ages: a recent Health Foundation report stated that millennials will be the first generation to have worse health problems than their parents when they reach middle age." Longevity: moving into the slow lane. One observation worth making is that attention to the course of mortality improvements often arises when issues within sub-groups become large enough to visibly impact the aggregate population. This was evident not only from the white non-Hispanic population in the US, but also in a recent UK occupational analysis where certain occupations were found to have experienced flat or even worsening mortality for quite some time. Such divergence between sub-populations with respect to mortality-improvement rates was also explored in an earlier blog where Torsten Kleinow outlined research carried-out by Heriot-Watt University. Consequently, the temptation to search for a single source of change rooted around 2010 is unlikely to be successful. That being said, nothing can deny the growing significance of T2DM within the UK and other Western populations. Not only has the incidence of diabetes increased, but we now understand more on the links between glucose metabolism and other diseases, including certain cancers and cognitive conditions such as Parkinson's and Alzheimer's disease. It is therefore unsurprising that both cancer and neurological conditions were also discussed in the The Actuary review. But while it seems beyond doubt that the prevalence of diabetes has dragged down mortality-improvement rates, it is a bolder view that this will result in UK mortality improvements of zero or below in the medium term. Indeed, such a view is challenged by the critical juncture we have reached in our approach to this previously untreatable lifestyle disease, in that we may recently have found not one, but two treatment modalities capable of reversing the condition for a substantial number of sufferers. Firstly, it has been observed for some years that bariatric surgery greatly increased the chance of durable remission. More recently, the DiRECT trial results demonstrated remission for nearly half of subjects using a weight-management approach. The existence of these findings will spur further research into the treatment of the condition. Considering that a decade ago most clinicians felt there was no realistic prospect of T2DM reversal, this remarkable progress should have an impact on disease incidence and severity going forward. 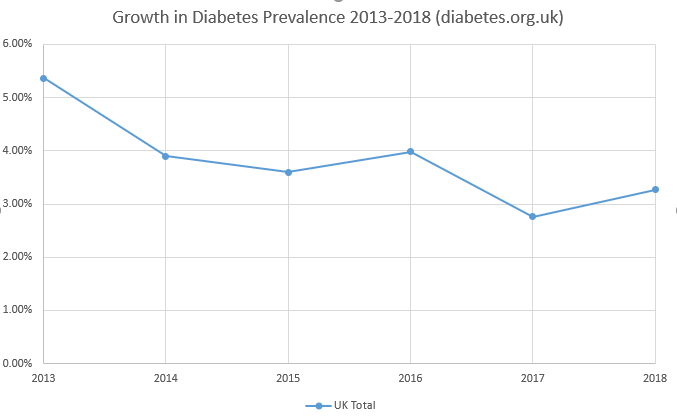 The following chart takes published data from Diabetes UK and plots the growth of the condition UK-wide since 2013. While it is not possible to draw a firm conclusion from only six years of data, diabetes growth may already show some sign of slowing. In short, if diabetes is truly a primary driver of the changes in UK mortality, then the current outlook may be more neutral than it first appears: with latest research continuing to demonstrate sustained remission, and as these techniques are embraced by the UK NHS, we might reasonably hope for concomitant future reductions in diabetes-related mortality.